I’m no domestic goddess, but once I saw the new cookbook Die Oper kocht (Opera Cooks), I wasn’t about to let other bloggers have all the fun. It’s a collection of recipes from various opera singers paired with campy photos. The recipes tend towards hometown specials. Some are rather complicated, though Danielle De Niese gets the low-effort award for her extraordinarily ordinary guacamole recipe. I might be a crap cook and my current kitchen is both ill-equipped and the size of a cupboard, but I love food. Let’s take a break from being on topic all the time and give this a shot. 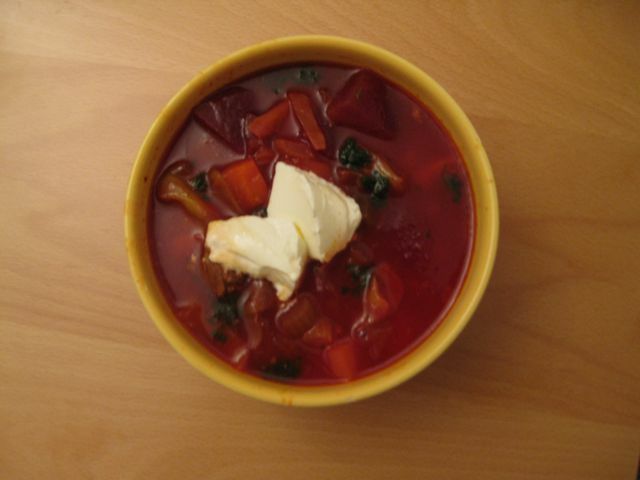 Read on for a taste test of Anna Netrebko’s borscht recipe. The text is in German (according to all-knowing Intermezzo, an English version is coming soon), but you also get a handwritten version of the recipe from its contributor in his or her native language. Which is good, because their versions are mostly more complete than the printed ones, and there are… discrepancies. But I’m just going to have to take the German on faith when it comes to Lado Ataneli’s Chatschapuri and Tschachochbili (Georgian looks cool, though). If you want to order the book, Morawa, Thalia, and the Wiener Staatsoper shop all have it in stock, and some of them have to ship internationally. The pasta section is supplied entirely by tenors. I laughed, but since it’s a German book I’m not sure if it’s actually meant to be a joke. The authors pose a few questions to each singer, including “If you could invite anyone to dinner, who would you pick?” The answers range from predictable (my mother) to pretentious (Albert Schweitzer) to AWESOME, namely Bo Skovhus’s choice of Alma Mahler. You know THAT would be a dinner to remember. Renée Fleming was probably trying to look glamorous by bringing in Daniel Boulud and the dessert he created for her, but since everyone else at least pretended to come up with something on their own, she ends up just looking affected. René Pape is the only one who gets bleeped out in his interview for swearing. “Ach, du Sch…,” he says. Also, good food! Here are some of my results so far…. Tasty, healthy, easy. But it needed some extra spices. 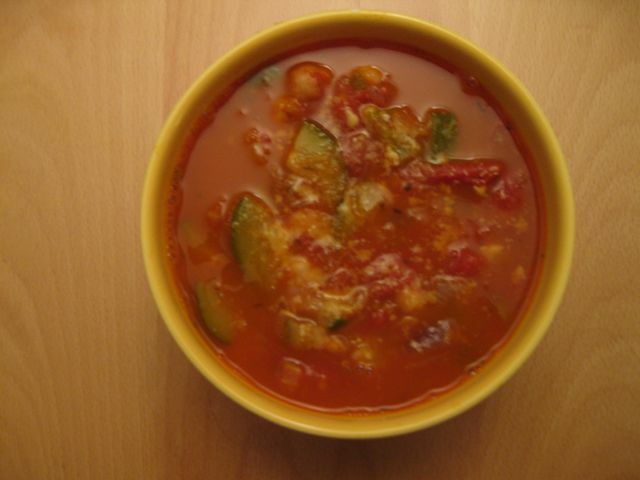 It also requires a blender, which I don’t have, so I got a vegetable stew (zucchini, leeks, tomatoes) instead of a soup. Note: The ingredient proportions in the printed German text are entirely different from the handwritten text, but it doesn’t matter that much. The German has one leek stalk, eight cloves of garlic (Italian food! ), and four onions; the Italian two leeks, six cloves of garlic, and two onions. I couldn’t read most of the rest (my Italian isn’t quite that bad, but his handwriting is). I mixed the sauce in after taking this picture, but this way it looks like the photo in the book. Pumpkin sauce sounded kind of weird, but it turned out to be tasty (as most things with lots of mascarpone are). 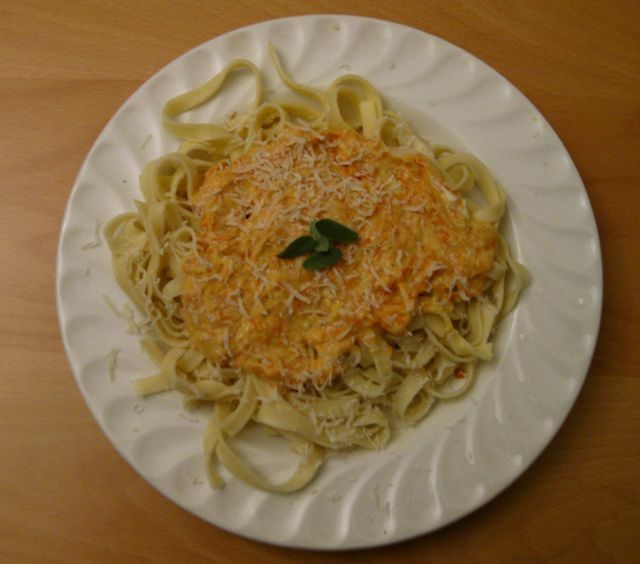 The recipe wants you to make your own pasta, but I’m lazy and bought fresh tagliatelle at the Naschmarkt instead (place near Dr. Falafel–recommended). This recipe made it from the handwritten German to printed German intact, possibly because it didn’t have to suffer translation. The handwritten version is more detailed, though. Admittedly I cut a corner here (subbed mozzarella for scamorza to save a trip to Käseland), but I hope these taste better when Filianoti’s granny makes them than when I do. 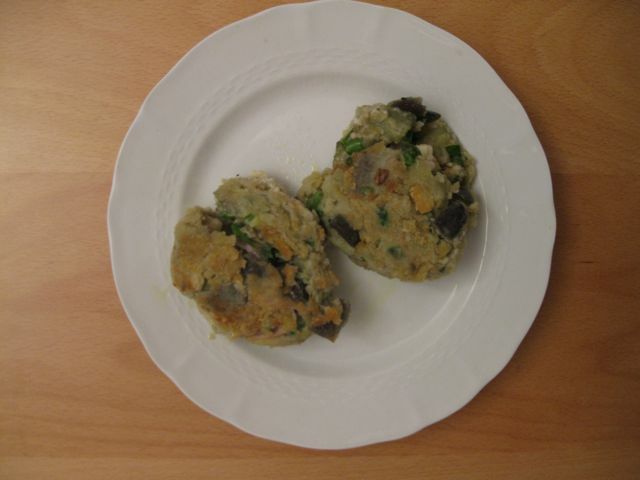 They look right, sort of (except for using poorly crushed Semmelwürfel for the bread crumbs, maybe that wasn’t ideal), but something might have gone wrong here. Or maybe somewhat greasy eggplant dumplings filled with ham and cheese are just not my thing. Note: the very clear handwritten Italian recipe tells you to put in 25 grams of each hard cheese. Somehow in the German this ends up being 250 grams. Big difference! This is borscht for the impatient, only taking around two hours. The meat was a little tough but overall it was very good. I realize I should have cut everything up into smaller pieces but whatever. Russian families must be large and/or very hungry, I left out the beans because there was no room left in my pot, and I was only making half the recipe. Also, borscht in German is the consonant party “Borschtsch.” I don’t do Russian so I can’t testify as to the accuracy of the German text here. I’m dying to try Janina Baechle’s asparagus risotto when Spargelzeit comes, and when I am once again in possession of a real oven there will be Beczala Apple Cake. ALSO to be more on topic: The Philharmoniker/Thielemann review is coming soon as in tomorrow, I’m working out some ISSUES I have with this orchestra, OK? You probably think I mean the sexism but no! It is So Much More.